ISS047e052707 (04/10/2016) --- The SpaceX Dragon cargo spaceship begins the final approach to the International Space Station. The spacecraft is delivering about 7,000 pounds of science and research investigations, including the Bigelow Expandable Activity Module, known as BEAM. 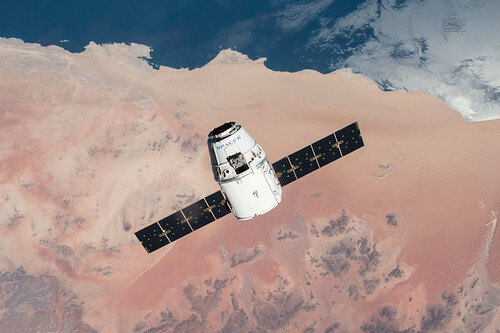 Dragon's arrival marked the first time two commercial cargo vehicles have been docked simultaneously at the space station. Orbital ATK's Cygnus spacecraft arrived to the station just over two weeks ago. With the arrival of Dragon, the space station ties the record for most vehicles on station at one time -- six.